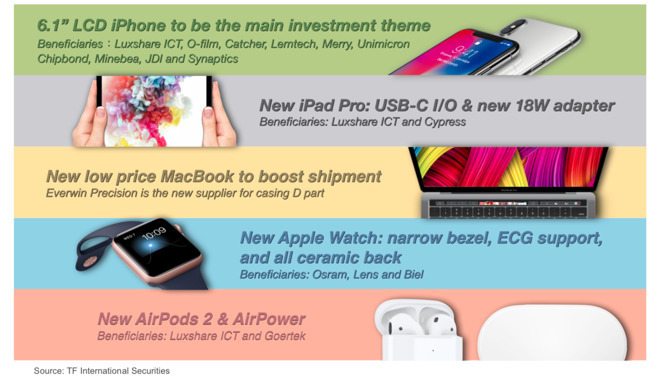 On Sunday, Apple analyst Ming-Chi Kuo released a note to investors, attempting to forecast what kinds of hardware and new products Apple will launch over the next 11 months. While the list does include many already-anticipated items, Kuo also included a number of items that were not previously discussed. Ming-Chi Kuo has been in the analyst game for a very long time. Even so, Kuo is like other analysts in that he isn't always right, so it's not wise to take his notes as the absolute truth. It is worth noting that, previously, he has been accurate with his last two research notes regarding Apple's product releases ahead of their launches. 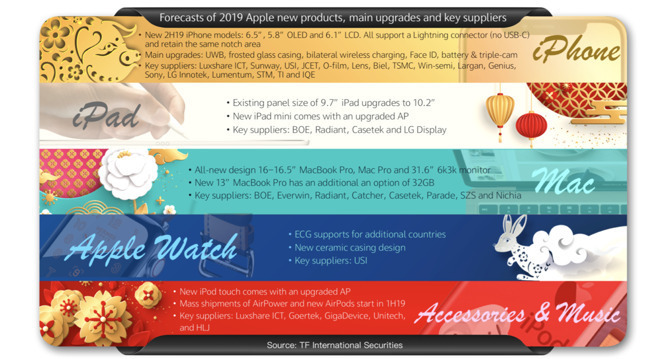 Back in July of 2018, Kuo predicted three new iPhone models were on the way, along with refreshed iPad Pros with Face ID, new Macs, Apple Watches with larger displays, new AirPods, and the release of AirPower. Two months later on September 10th, two days before Apple's September Event, he released another research note, adding more things to the list including an 18W USB-C power adapter, Touch ID on the new low-priced MacBook, ECG support and an all-ceramic back on the Apple Watch and more. Kuo got almost everything right. He missed on the iMac, which we've yet to see, AirPods, and AirPower. While the latter two have been hit with delays, rumors suggest launches for both will occur in 2019. Kuo expects the 2019 iPhone lineup to stay pretty much the same as the current-generation models, with the same three variations of iPhone maintaining the same old notch. He also believes the 6.1-inch model will keep the LCD display instead of moving to OLED to match the rest of the trio, but he says it may be upgraded to have 4 gigabytes of RAM like the other two iPhones. All three models will apparently maintain the Lightning port instead of switching to USB-C, but there's no mention of what charger will ship in the box. We can only hope that Apple will include their 18W USB-C fast-charging capable power adapter with a USB-C to Lightning cable in the box, as while the old 5W adapter does the job, it's a lot slower than it could be. All or part of the new iPhone lineup is expected to include a frosted glass casing, similar to the Google Pixel 3, Ultra-Wide Band for more accurate GPS and location-tracking, upgraded Face ID with a more powerful flood illuminator, larger batteries, and a triple camera setup that features a new ultra-wide lens. Along with all of that, he suggests there could be the addition of what he's calling bilateral wireless charging, namely repurposing the wireless charging coils to allow the iPhone to provide power to other devices wirelessly, a feature that could be handy for accessories such as the AirPods Wireless Charging Case, which he expects to be released in the first half of 2019. If you don't want to use your iPhone to charge your AirPods, Kuo is also anticipating the long-awaited AirPower charging mat sooner rather than later. He's also expecting a new iPod touch that will ship with an upgraded processor. 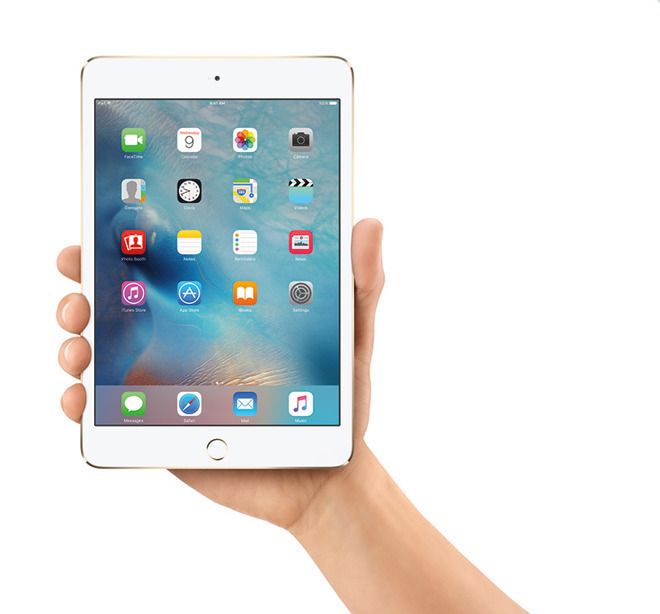 Kuo believes we'll be seeing two new iPad Pro models with upgraded processors. While this is a fairly easy-to-guess item, it probably won't happen soon as the iPad Pro just got upgraded in October with the most powerful mobile chips Apple has produced. 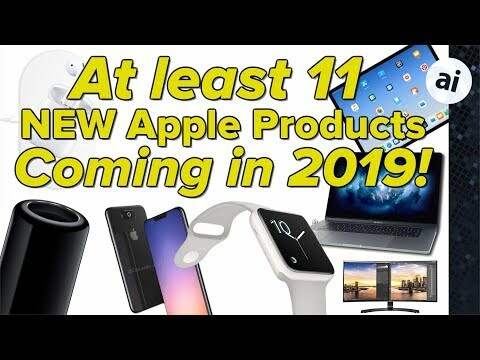 If they do come this year, it'll most likely be towards the fall or winter. .
We're also expecting two new iPads including the iPad Mini 5 and a seventh-generation iPad. Both models will continue to use a lightning connector, rather than shift over to USB-C like the iPad Pro, as well as sticking with Touch ID instead of moving to Face ID. They should both get upgraded processors, but Kuo believes that the 9.7-inch iPad will move to a 10.2-inch display instead. It is likely to maintain the same form factor as usual, but get slightly slimmed down bezels to match the larger screen size. Two new iPads are likely to surface soon, since regulatory filings for them have already surfaced, so it's just a matter of time before they get released. Last year's iPad was released at Apple's March event, and it is already expected a similar event will take place on March 25th, there's a good chance they will be released at that time. For the Apple Watch, Kuo doesn't yet expect very much. He simply believes that the ceramic casing design that was excluded from the Series 4 will be coming back, but it isn't clear if it's for the existing model or for a new Series 5 version. He also believes the ECG feature will be coming to additional countries this year. Currently it is limited to work in the United States, as Apple has to pass regulatory muster in other regions before enabling the function elsewhere. Kuo's predictions for the Mac product family is where some of the more exciting elements lie, with three all-new products tipped for launch. First and most unexpected, Kuo believes Apple will release a 16-inch to 16.5-inch MacBook Pro. Up until 2012, Apple sold a 17-inch MacBook Pro, so this isn't the first time Apple will have offered a notebook larger than 15 inches in size. It is thought there are many people who would love to see a larger MacBook Pro, and not just for the extra real-estate, as the physical gains could also bring with it a larger battery, better cooling, and higher specifications to match its stature. For the smaller 13-inch MacBook Pro, it is expected to gain an option to have 32 gigabytes of RAM, following the 15-inch model's maximum memory capacity upgrade from 2018. 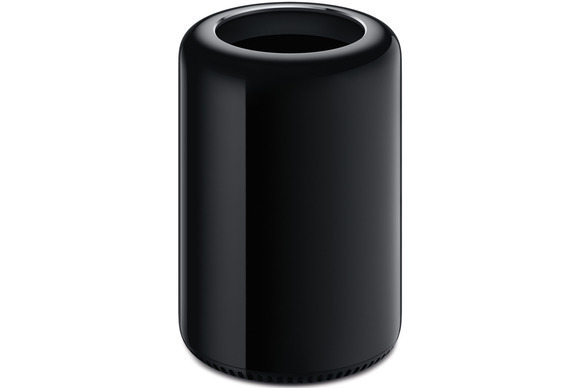 The Mac Pro, thought to be released sometime this year, is already expected to be a modular computer following Apple's comments on the redesign process made in April 2017. While little else is advised about the Mac Pro, Kuo adds the design this time around will feature easy-to-upgrade components. 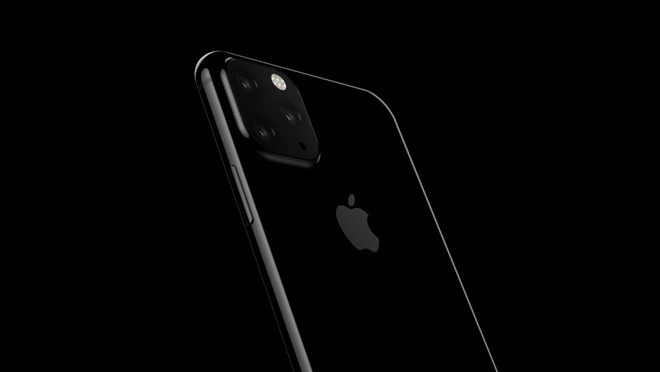 After a tease on 2017, in April of 2018, Apple confirmed the model is a 2019 product. Given the amount of time spent designing it, a launch of the Mac Pro is all but certain before the end of the year, but it remains to be seen how modular it will end up being. Finally, anticipated to launch alongside the new Mac Pro is a brand new high-resolution monitor. At a time when 5K2K widescreen displays are coming on the market, Kuo is expecting Apple to release a 31.6-inch 6K3K display. The 6K3K term basically means a 6K resolution on the wide end and 3K resolution on the tall end, approximately 6,144 x 3,072 pixels, and equates to almost 4 million pixels more than the current iMac 5K's display. To go with the high resolution, it is also thought to have outstanding picture quality, courtesy of a Mini LED-like backlight design. Who are Kuo’s clients anyway? More of an effort should be made by Apple for the iMac, the all-in-one desktop computer. As the replacement cycle opens up for the innovative design of the highly successful iMac 2009-2012, it is important for Apple to listen to what potential buyers want to see in an upcoming iMac 2019 model. 1- First and foremost, it's time for Apple to return back to the basics and introduce updated components into a brand new iMac 2019 with the iMac 2009-2012 form factor which provided ample space behind the display to ensure proper heat dissipation and great acoustic properties. The iMac 2009-2012 form factor projected an overall image of quality and sturdiness. 2 - Optional 8 to 14 TB Fusion drives with a 256 GB SSD. A 8 TB Seagate BarraCuda Pro SATA HDD, 7200 RPM, 6 Gb/s transfer rate, 256 MB cache, 3.5 inch internal hard drive for desktop computers has a retail price of $272.57 on Amazon, while the top of the line 14 TB model has a retail price of $576.29. The 10 TB model sells for $344.99 and the 12 TB model sells for $437.99. If these internal hard disk drives for desktop computers are available from Amazon, Seagate and Hitachi (HGT), I expect them to be available when buying a brand new iMac. It's both a question of meeting my needs and future proofing my purchase of a brand new iMac. There is no excuse for offering brand new iMacs with only 2 or 3 TB Fusion drives. Leave a cheaper option with a 2 TB Fusion drive, but offer a standard 6 TB Fusion drive with a 256 GB SSD and optional increments of 8 TB to 14 TB Fusion drives with a 256 GB SSD. As Apple offers iPads and iPhones that come standard with a 256 GB SSD, it should be easy to standardize on 256 GB SSDs for Fusion drives in iMacs. 3 - Exceptional sound quality comparable to the iMac 2009-2012, possibly due to the great acoustics of the iMac 2009-2012 form factor and the loudspeakers used. Needless to say, exceptional sound quality is a key feature for anyone who stores his digital music collection on an iMac and enjoys listening to music while performing other tasks on an iMac. 4 - A next generation desktop CPU and desktop GPU for the all-in-one desktop iMac, not the less powerful CPU and GPU alternatives typically used in portable computers. 5 - A RAM access door to add memory modules after the iMac is bought. 6 - Possibly a digital FM radio tuner to make it possible to listen to music, talk shows and local news while working on an iMac. I dream of the possibility to watch TV news and series in the top right corner of an iMac while using the iMac to work or read, but I accept that the time has not come yet for such a feature. 7 - Possibly a larger display, a 30, 32 or 35 inch display, just like Apple was the first computer maker to offer in 2009 a standard 27 inch display in an all-in-one computer for the general public. 8 - Possibly some connectors on the right side of the iMac's display for easier occasional access to connectors, let's say 2 USB connectors and 1 or 2 Thunderbolt connectors. 9 - Possibly a better air flow with the possibility for each user to set the fans to run all the time at 10% of their maximum speed, thereby providing a quiet but constant air flow. At present, there is a third party utility "TG Pro" with similar functionality, but it would be great if it were included in every iMac. I hope that this comment was helpful to Apple and Apple engineers as they work on the features to include in the next iMac. An exceptional design for the right price should rekindle iMac sales. Funny. As a daily user of a top end 5k iMac....I don’t care about any of that. All I want is Face ID on iMac. The 31” 6k monitor sounds interesting. And expensive. Haven’t bought an external monitor in years because there is nothing on the market that compares to the 5k display on iMac, and I’m not going to switch between that and something largely inferior. I don't think this is a realistic expectation. Spinning drives are dead, and I don't see anyone wanting them mounted inside their machines. Yes, storage is great, but (especially for a desktop) external is a better option. I have roughly 25tb of storage available on my iMac - 1tb is internal SSD. The rest is hanging on a couple of external drives, and on two NAS clusters. Having a single, large drive inside my iMac that I cannot get to when it fails is just not very smart. It's not happening. This could be a possibility - I'm sure some would like to have great speakers in their desktops. For me, I'd rather have a nice 2.1 system with a decent sub. I've got a twenty year-old Altec Lansing 2.1 setup that sounds way better than any internal speakers will ever sound. My sub is on the floor, and my speakers are hidden behind my iMac and external monitor where I can't see them. Apple had better not remove the RAM access door in future iMacs. It's unthinkable that this was done on the 21" already and I suspect the next 27" will see the same thing happen. Hasn't this already happened with the iMac Pro as well? I'm sorry to have to say it, but this is a silly idea. FM tuners are superfluous these days as pretty much every FM station I can think of has Internet streams available. Ditto TV with IPTV services. I occasionally watch my DirecTV Now feed in a window while I work, and even traditional cable companies such as Comcast (horrible though they may be) offer streaming live TV through your computer. No need to add either of these via hardware. This would be nice, although there are external hub (such as this one) that make connections easier. As I've said in other posts, I'm sorely disappointed that an upgraded MacBook or equivalent isn't being mentioned. 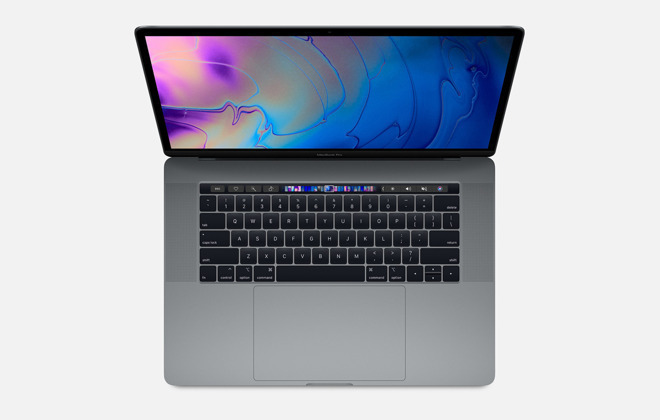 A smaller (11" or 12"), very functional and capable machine, with modern peppy innards and various ports, without the needless bells and whistles Apple recently seems to be so proud of (who needs a TouchBar, so what if the bezel's still visible, is 1 or 2 mm thinner really a big deal?). Maybe call it MacBook +, or MacBook Air +, or a MacBook Pro Compact, who cares, but such a machine is very much needed. Oh, and I want the glowing Apple on the lid, and the startup chime. A 31.6 inch screen with an aspect ratio of 19.5 x 9. Pixel dimensions of 6,240 x 2,880 with a pixel density of 218 ppi. This is basically the same screen that is currently in the iMac 27 inch but wider. Exactly the same height and pixel density but ultra wide format of 19.5x9 instead of 16x9 takes the screen diagonal to exactly 31.6 inches. What this means is that should you wish (seems excessive but) you can place the new 31.6 incher alongside a current gen iMac and it matches up perfectly, pixel for pixel, meaning this can now be a second screen for iMacs, iMac Pros or a primary screen for the new upcoming Mac Pro. Obviously the new screen will have reduced bezels and will house a series of Thunderbolt 3 / USB C ports and will provide power for laptop charging along with speakers, Full HD front facing camera, but the screen technology will be an evolution of what is already in today's 27 inch screens, only wider. Good call! I was also thinking they would keep the resolution at 2880 on the wide-end but wasn't sure about the tall-end. Very interesting that it comes out to 31.6" with that aspect ratio. Bravo. I want the new iMac to come with a sun roof. 7. Could be possible, but I don't think so. Maybe a standalone in one of those sizes. 2. Why use a Fusion drive when external TB3 drives will offer good transfer rates and ability to expand? 3.5 inch drives are massive and would significantly increase the depth of the unit. Instead have minimum of 500GB SSD (would prefer 1TB) as standard on all iMacs. 5. RAM access always a good idea. 6. A large number of digital radio stations are available online and through iTunes or other portals. Why the need for a digital tuner? Very 1990s to me. 7. MCK suggested larger screens are on the way. FaceID on a Mac is a great idea. That would work for both iMac and laptops. Plenty of space in the bezel. 1. New AirPods - preferably in black. Wireless case charging would be good. 2. MacPro - would be fun to have a modular unit to play around with. I miss my old G4 tower for that.